EduCulture’s Jon Garfunkel works with the cast members of Snow Falling on Cedars at Bainbridge Island Historical Museum. Only What We Can Carry (OWWCC), EduCulture’s heritage and human rights education program, is excited to be partnering with Bainbridge Performing Arts (BPA) and other Island organizations in a full menu of educational activities surrounding and supporting the BPA stage adaptation of the book Snow Falling on Cedars, written by Bainbridge Island author David Guterson. OWWCC will be involved in numerous pre and post-show events throughout the months of February and March 2015. 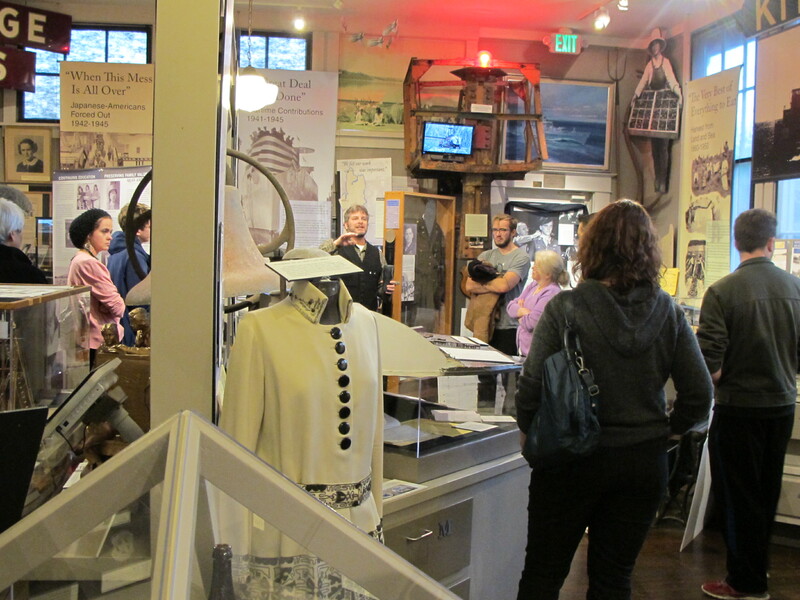 Cast members discuss the story and look over related artifacts at the Historical Museum. Click here to read an Inside Bainbridge article about the production and EduCulture’s involvement. Having this play produced and performed on Bainbridge Island presents a special opportunity to make many connections with this locally grown story. As many know, the historical context in which the novel takes place surrounds WWII and the Japanese American Exclusion, and the Pacific Northwest setting for the story is drawn from our own Island’s heritage. 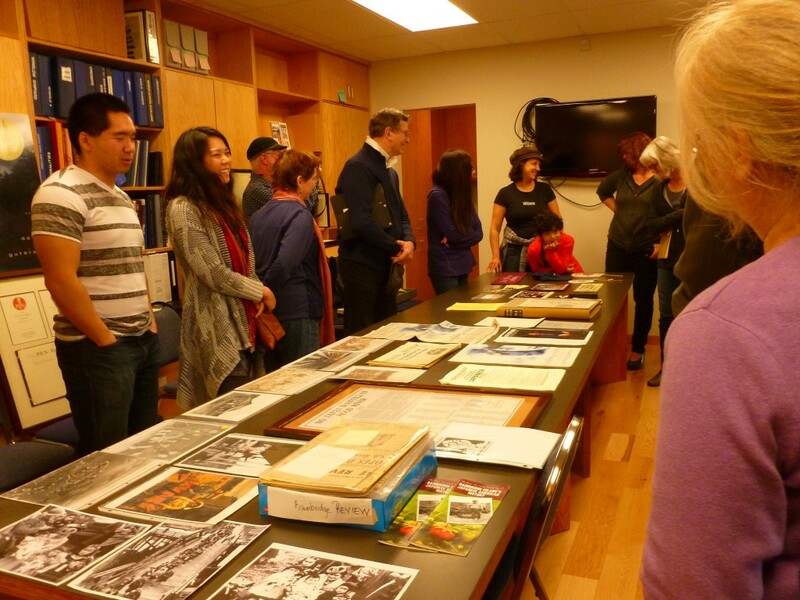 – Meeting with cast members at Bainbridge Historical Museum and Suyematsu Historic Farm to serve as a resource for them and to discuss the “real” story of Japanese American Exclusion behind the fictional account. – Japanese American Exclusion Film Talks at the Bainbridge Public Library; February 27; 6:30 – 8:30 p.m.
– First Friday Art Walk at the BPA Gallery; “Ansel Adams – A Portrait of Manzanar”; March 6; 5:00 – 7:00 p.m. Exhibit ongoing in the BPA Gallery through March 31. – Post-Show Discussions; Snow Falling on Cedars; EduCulture will lead post-performance “talk backs” with cast members and Bainbridge Islanders who lived through WWII and Japanese American Exclusion. Discussions, in a Q&A format, will be facilitated by EduCulture’s Only What We Can Carry Project, and will feature esteemed local guests such as Kay Sakai Nakao, Mary Woodward, and Lilly Kitamoto Kodama. March 15, 22, and 29 following the 3:00 Sunday matinee. – Assisting with special matinee performances of Snow Falling On Cedars for local middle school and high school students; March 26, including facilitating pre and post-show classroom and curricular activities focusing on the real stories behind this fictional account of WWII and Japanese American Exclusion. For more information on this rich program of events, please follow this link to Bainbridge Performing Arts. Check out our Facebook page for more about the Snow Falling on Cedars cast & activities. Also, check out the upcoming edition of Currents Magazine published by the BI Arts & Humanities Council for more about these special programs. We also invite you to visit our new Snow Falling on Cedars page in the OWWCC section of our website for a list of references and resources for further study of the realities that informed this fictional account of WWII and the Japanese American experience of exclusion. Hope to see you at a Snow Falling on Cedars production and at the many events surrounding these performances. This entry was posted in Events, Only What We Can Carry by Cindy Vandersluis. Bookmark the permalink.